Excavators have been the machine of choice in the construction, mining, and forestry industries for decades, and their popularity has only increased over the past ten years as manufacturers have made significant improvements in power, abilities, and comfort. Purchasing an excavator, whether new or used, is an exciting prospect, but there are several things to consider before you buy. Read on for some helpful guidelines when choosing your new workhorse. What Do You Need To Get The Job Done? Consider your excavation needs and intended applications before selecting a model. This is the most important purchasing factor and it helps maximize satisfaction and machine use. Determine whether you need an excavator for minimal or heavy use, whether a full-size or compact excavator is more appropriate, and what attachments you will need to get the job done. What Size Excavator Do You Require? If you choose an excavator that’s too small, you won’t have the digging power and depth necessary for certain projects; on the other hand, an excavator that’s too large isn’t a wise investment throughout the life of the machine as it might not be properly utilized. 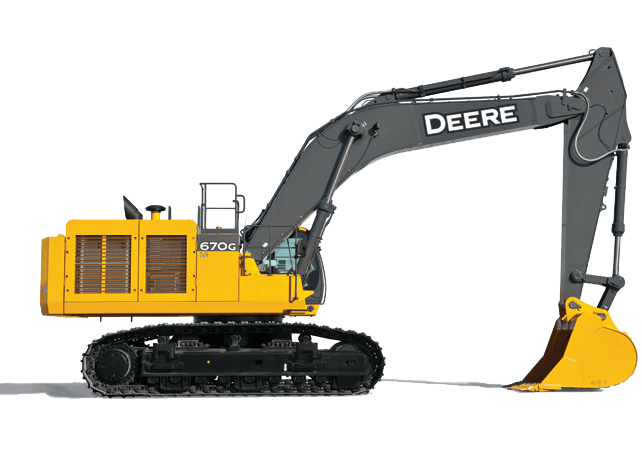 Remember, a full-size excavator for sale in California, like the John Deere 670G LC, may require the operator to have a commercial driver’s license or additional certifications. Additionally, large machinery like the aforementioned model require a trailer and towing vehicle because the machine is too large to drive down most city and country roads (and is often prohibited). Crawler excavators are the most common type on the market, but wheeled excavators and long-reach models are also available. If your worksite has uneven and difficult surfaces (think logging or mining work), a crawler may be best. Also ideal for these industries is the long-reach excavator because its extra-long boom enables operators to reach tall trees and vegetation. Finally, the zero-tail-swing or reduced-tail-swing excavator, like the John Deere 60G, are perfect for working around buildings, tight spaces, or areas with obstacles due to superior flexibility and 360-degree rotation. What Attachments Do You Need? After determining whether compact or full size construction equipment is right for you, consider your intended applications. Attachments improve the basic functionality of an excavator and can help you save time and money; however, not all attachments are available for all makes and models, so it’s vital to do your research. Construction industry professionals will likely need hydraulic hammers for breaking up concrete, buckets for rock and pavement removal, and augers for drilling. Logging industry professionals looking for an excavator for sale typically need rippers for breaking up compact and frozen soil. Rent or Buy? New or Used? After determining which type of excavator is best for you and narrowing down the models you’re most interested in, it’s time to decide whether you should rent or buy. And if you buy, should you go with new or pre-owned equipment? The best way to determine whether you should buy an excavator is by evaluating whether your standard workload justifies the expense of a full-time machine and its required maintenance. If you only need an excavator on a particular jobsite for a few hundred hours per year (which breaks down to about 7-15 hours of use per week) or for limited projects, it’s best to rent. Renting has the added benefit of allowing you to switch sizes and models more frequently than you could if you owned the equipment, and enables you to get a feel for different brands and their design. An added bonus: renting means you can use the latest and greatest excavators that you may not have been able to afford if you purchased. You can research size, weight, tail swing, auxiliary hydraulics, and more on our website. Selecting the right excavator is important for job completion and safety, purchase and equipment satisfaction, and your bottom line. Speak with one of our highly trained sales experts today to learn about optional features like monitoring systems, pilot hydraulic controls, enhanced power modes, and anti-vandalism systems. Contact us today at Papé Machinery Construction & Forestry to learn more about John Deere excavators for sale in California, Oregon, and Washington.